A first-of-its-kind relationship between a high school and a nonprofit shows promising results for students. Reeds Spring High School has formed a partnership with I Pour Life, a Springfield-based nonprofit that aims to bring sustainable change to individuals, families, and communities. A LifeStrengths coach from I Pour Life visits RSHS once a week. The coach meets with students and develops strategies to improve attendance, academic performance, behavior, and relationships with family and peers. School staff members sometimes recommend students to the I Pour Life coach. Other times, students choose to visit on their own. More than 50 students have participated at some point this school year. 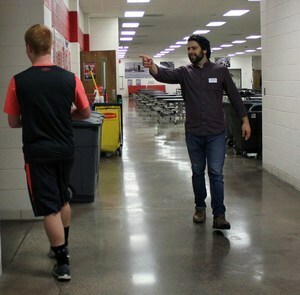 Photo caption: I Pour Life's Tyler Head engages with a student at Reeds Spring High School.